Saturday, May 7 Register today! More than 100 state parks and historic sites are participating in the fifth annual Parks & Trails NY and New York State Parks I Love My Park Day on Saturday, May 7. To celebrate the 5th anniversary of I Love My Park Day, the event will expand to several National Parks in New York State as well as sites in the Adirondacks and Catskills. Join your friends, family and neighbors and sign up today to volunteer at your favorite state park or site. 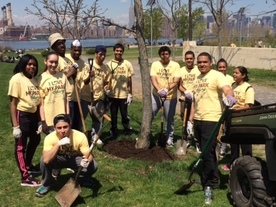 From beach clean-ups to trail restoration and tree and flower plantings, hundreds of events are planned to spruce up our parks and get them ready for the summer season. Make a difference at the parks you love, and register today to volunteer! 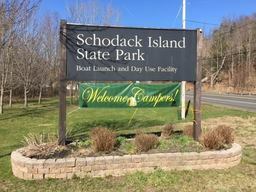 State Parks’ newest campground, located along the majestic Hudson River at Schodack Island State Park, is now open! With many sites offering 50-amp electrical hook-ups for trailers and recreational vehicles, the campground is a great choice for camping from early spring to late fall. Reservations can be made up to nine months in advance at Reserve America or by calling toll free 1-800-456-CAMP. Read more. Spring is the perfect time to #GoPlayOutside and explore. Our parks offer events and fun for all members of the family. 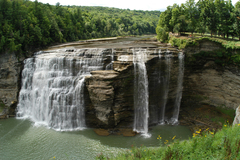 It's maple syrup season so bring your appetite to Letchworth State Park for April Maple Weekends. Every Saturday and Sunday morning in April, breakfast is served featuring entrees made with New York’s best local syrup and cream. An informational hike follows breakfast and begins at 11 am. Looking for a new hobby for your youngster? Roberto Clemente State Park’s soccer program, begins right as school starts to wind down. If you don’t mind getting your hands (and feet!) dirty, then a Wetlands Walk could be a special spring break activity for the whole family. This 1.5 mile walk will explore the vital wetlands of Thacher State Park, and is suited for children and adults alike. For those seeking a less hands on experience, take a relaxing sunset stroll at Jones Beach State Park or enjoy a free tour of the night sky and stargaze at Grafton Lakes State Park. Perhaps you want to spend your spring break giving back. 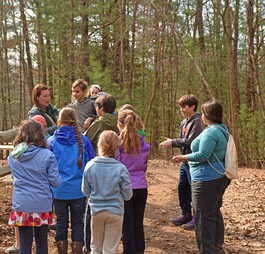 Saratoga Spa State Park, Minnewaka State Park Preserve, and Clay Pit Ponds are just a few of our parks taking part in Earth Day clean up initiatives. Planting Fields Arboretum State Historic Park is even hosting an Arbor Day Festival, complete with performances, face painting, a petting zoo and more to raise awareness about the environment. For more events and activities check our calendar. New York state parks, historic sites and campgrounds hosted another successful season last year, with 65.3 million estimated visits, Governor Cuomo recently announced. Park attendance increased five percent from 2014 to 2015, and nearly 14 percent since 2011. Park attendance was boosted by a variety of factors, including the return of fireworks to Jones Beach State Park after a five-year absence; national exposure for Letchworth and Watkins Glen State Parks, which were ranked first and third best state parks in the nation by USA Today; improvements to the newly designated Buffalo Harbor State Park on the city’s waterfront, and favorable weather throughout the summer and late into the fall. Annual park system attendance has climbed steadily from the 57.2 million visits recorded in 2011, reflecting Governor Cuomo’s commitment to improving State Parks, expanding access to outdoor recreation, and promoting the state’s vast tourism and recreational attractions. Read more. 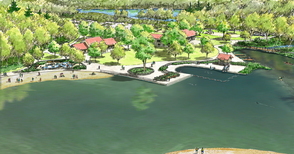 In March, Lieutenant Governor Kathy Hochul and State Parks Commissioner Rose Harvey unveiled a $2.2 million project to transform the popular beach area at Chenango Valley State Park. 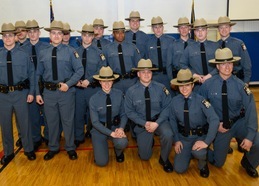 Seventeen men and women recently graduated from the New York State park police training academy. The new park police officers are already keeping park visitors safe and protecting the natural and historic treasures of the park system. Rob Basch (top photo): I moved to Long Island City (LIC) seven years ago and Gantry Plaza State Park was basically my backyard so I wanted to get involved and make a difference. Mark Christie (bottom photo): Since 1998 when the people of Hunters Point, Queens were given a world-class park on the waterfront. 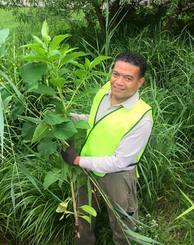 I found it necessary to be the guardian of this rare New York City gem and to do what I could to garden, clean and keep the park in pristine condition. Describe a recent project or program that you organized. In November we initiated the first LIC Bulb Festival. We reached out to a horticulture company and were able to get a donation of 3,000 daffodil and tulip bulbs. We organized a community event that brought out over 60 volunteers to help plant bulbs throughout the park. We supplied food and refreshments and had a beautiful day. We were particularly excited about all the young children who came out with their parents and helped plant the bulbs. The bulbs are coming up now and many of the young children that planted these bulbs are very excited to see the results. This has inspired them to get more involved with nature and the park which is a great benefit for our community. 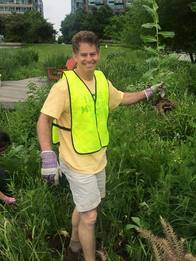 We, as volunteers, are passionate about our parks. Over the last 18 years members of our group have organized volunteers in various tasks to keep the park a special place for all. As our community has grown and changed, and attendance to the park has multiplied, we have always found organizing volunteers and accomplishing tasks extremely rewarding. Gantry Plaza State Park is a special place and our goal is to keep in that way. I handle education and outreach in boating safety with an emphasis on the national Wear It! campaign underscoring the importance of life jackets. 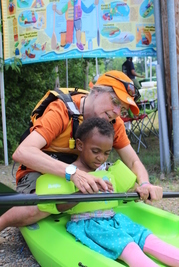 I also train and certify instructors, oversee Park employees becoming trained kayak instructors, participate in Paddle Fests, and coordinate a statewide boating safety and life jacket awareness program in print, radio, and TV. My job is all about safe boating which is also fun boating. What’s the coolest thing you’ve ever done as part of your job? The most inspiring to me as a boating educator was attending the graduation ceremony for 22 young students from Breezy Point in 2015 as they received their boating safety certificates. This was the first class in two years after their community was severely damaged by Hurricane Sandy in 2012 and their dedicated instructors were finally able to teach a course again. Is there a favorite destination in the system you’d recommend to someone? There are so many fabulous parks and I work with so many that I would hate to slight anyone, but I’ll go with Midway State Park as a sentimental favorite because I grew up enjoying the amusement park on the shores of Chautauqua Lake and now enjoy sharing it with my grandniece and nephew. What could be better than being able to work in and share the best backyards in all of New York State for everyone to enjoy?